Outlook organizes your emails, calendars, contacts, tasks, and to-do lists, all in one place. That organization starts with your email account. From there you can start working with emails, turning them into tasks or appointments, and storing information about the people you interact with in your contacts so that you never have to remember an email address or a phone number. Let’s take a quick walk-through of some basic tasks. Your first action is to set up your Outlook account. After that, you’ll be ready to start receiving and sending email, use the calendar, create contacts, and work with Outlook tasks. Setup is automatic if you used an earlier version of Outlook on the same computer. 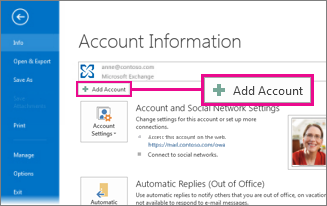 If you didn’t, the Auto Account Setup will start the first time you start Outlook and walk you through the process. You’ll be asked for your name, email address, and a password. That’s usually enough, but if automatic setup fails, Outlook will ask for a few more pieces of information, such as your mail server name. If you don’t have that info, your email provider can give you the details. Note: If you want to add another email account later, when you're ready choose File > Add Account to start Auto Account Setup. The quick access bar is an important part of your Outlook experience. And it's an easy way for you to move among the top Outlook features—Mail, Calendar, People, and Tasks. The bar is in addition to the standard tabs and ribbons that provide you with an assortment of tools and options to help you use and manage Outlook. Typically located at the bottom of the Outlook window, the quick access bar shows—depending on selected settings—either button names (left image) or icons (right image) associated with feature names. You can control which buttons (or icons) appear on the quick access bar and even in what order they appear. Choose More > Navigation Options. To change the number of buttons or icons that appear on the bar, increase or decrease the default setting of 4 for Maximum number of visible items. 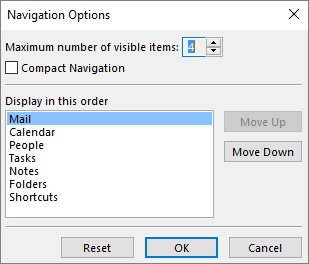 To view icons instead of names, select the Compact Navigation check box. To rearrange how buttons or icons are listed, select an item in the Display in this order box, and then choose Move Up or Move Down. Tip: If you don't like the changes you made, or just want to start over, choose Reset. Email connects you to people inside and outside your organization. You can add an electronic signature and attachments to your email messages. From any mail folder (such as your Inbox), choose New Email. Keyboard shortcut: To create an email message, press Ctrl+Shift+M. When you’re done composing your email, choose Send. For more information, see Create an email message. Create personalized signatures that appear at the bottom of your messages. Signatures can include text, images, your Electronic Business Card, a logo, or even an image of your handwritten signature. In a new message, choose Signature >Signatures. On the Email Signature tab, choose New. Type a name and then choose OK. In the New messages list, choose the signature that you want to be added automatically to all new email messages. If you don't want to auto sign your email messages, you can ignore this option as (none) is the default value. In a new message, choose Signature, and then choose the signature that you want. For more information, see Create and add an email message signature. To add a recipient, click in the appropriate box and enter the recipient's name. To remove a recipient, click in the appropriate box, choose the recipient's name, and then press Delete. For more information, see Reply to or forward an email message. For more information, see Attach a file, message, contact, or task to an email message. Depending on the version of Outlook you're using, there might be multiple options available to open an attachment. For more information, see Open attachments. For more information, see Save attachments. Appointments and meetings are a byproduct of your personal and business life and your calendar is the perfect vehicle for managing both. 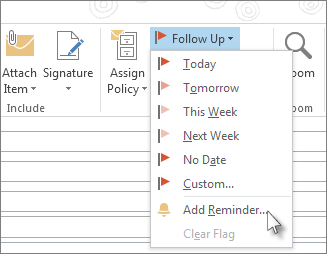 With Outlook you also can set reminders of scheduled events. For more information, see Schedule an appointment. Reminders pop-up in an alert window so you don’t miss an important deadline. You can set or remove reminders for almost anything in Outlook, including email messages, appointments, and contacts. Open an Appointment or Meeting, and then in the Reminder list box, choose the amount of time before the appointment or meeting when you want the reminder to appear. To turn off a reminder, choose None. Choose Follow Up > Add Reminder. Tip: You can quickly flag email messages as to-do items by using reminders. These reminders make the message appear on the To-Do List and in the Tasks folder, but doesn’t automatically add a reminder. Right-click the flag in the message list to add a reminder. Or, if you have the message open, choose Follow Up > Add Reminder. People is the bucket name for those persons—and companies—who form your business and personal contacts. Who you add as a contact is completely discretionary and the only restrictions that might apply as to who you can or can't add are the limitations that you or your company impose. Your company, for example, might have rules about correspondence with certain external email addresses. A contact can be as simple as a name and email addresses, or you can include, for example, details such as street addresses, multiple phone numbers, a picture, and birthdays. You'll find your Contacts under the People option in the shortcuts bar in the lower-left corner of the Outlook window. For more information, see Create or add a contact. Saving a copy of contacts in your address book is a good practice. In Outlook 2013 or Outlook 2016 for Windows, you can download a comma-separated value (.csv) file of your contacts to your device and open it in Excel. 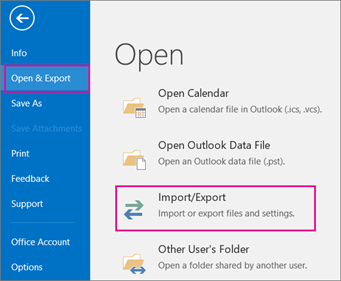 Open Outlook, choose File > Open & Export > Import/Export. In the Import and Export Wizard, choose Export to a file > Next. Choose Comma Separated Values and then, on the Export to a File page, choose Contacts as the folder to export from for your account. Important: Before proceeding, make sure the Contacts folder you choose is attached to your email account. This is especially important if you're carrying out these steps from another person's computer. Choose Next > Browse, and then go to the location where you want to store the comma-separate values (.csv) file. Type a file name, and then choose OK > Next. Choose Finish to start the export process. Note: Outlook doesn't display a message when the export process is complete. 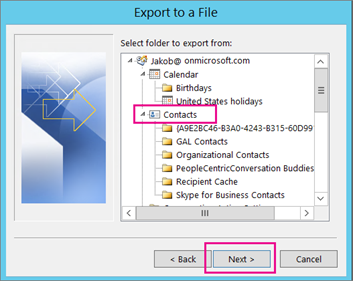 The comma-separated value (.csv) file of your exported contacts typically is opened in Excel. Browse to the location where you saved the .csv file and open it. Confirm your contacts are listed in the file. Note: There might be empty cells. It's normal. Close the file without making any changes to avoid potential problems importing the file on a different device that has the same version of Outlook or a different email service. Many people keep to-do lists—on paper, in a spreadsheet, or with a combination of paper and electronic methods. In Outlook, you can combine various lists into one, get reminders, and track task progress. Open Outlook, and on the Home tab, in the New group, choose New Items. Choose Task, fill in the task form as needed, and then choose Save & Close. Keyboard shortcut: To create a new task, press Ctrl+Shift+K. For more information, see Create tasks and to-do items. Choose on the quick access bar or Tasks on the navigation bar. Choose on the ribbon or press Ctrl+Shift+K to create a task. Add a Subject, choose a Start date and Due date, and set Status and Priority as needed. Accept or clear the default selection of the two check boxes: Keep an updated copy of this task on my task list and Send me a status report when this task is complete. If needed, type a message in the content block below the check boxes. If you want the task to repeat, choose Recurrence on the ribbon, select the options you want in the Task Recurrence dialog box, and then choose OK. Note: If you assign a recurring task, a copy of the task remains in your task list, but it never updates. If you select the Send me a status report when this task is complete check box, you receive status reports for each completed occurrence of the task. 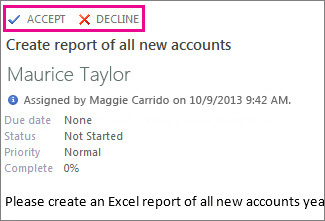 Tip: Outlook can track the progress of a task assigned to one person. If you want multiple people to work on a task, divide the task into smaller pieces or assign each task individually. For example, to track a report to be written by three writers, create three separate tasks and assign each individual task to the appropriate writer. When a task is created and assigned to you, it appears in your Inbox. In the reading pane, choose Accept or Decline. Open the task, choose Accept or Decline on the ribbon, and regardless of the option you chose, select either Edit the response before sending or Send the response now, and then choose OK. 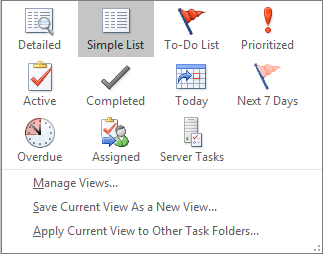 Note: Accepted tasks appear in your Outlook task list. If you open a task, you can Reply, Reply all, or Forward to the person who assigned the task to you and to others as appropriate. You also can include a comment in the message block. You can choose how you view your tasks, and then, based on what you choose to print, in what format—Table Style or Memo Style—the task is printed. If you select a single task to print, for example, then the only print setting available is Memo Style. But if you choose a list such as the To-Do List, a Table Style print format also is offered. Choose on the quick access bar. Choose a single task in one of your folders—To-Do List or Tasks list—or choose a folder. Choose File > Print and select the format (if available) under settings. In Outlook, you can print items such as email messages, contacts, calendar items, or larger views, such as calendars, address books, or content lists for Mail folders. 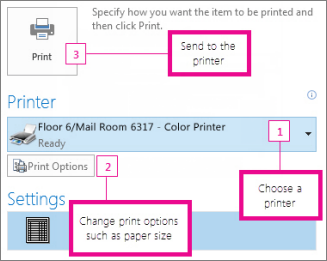 Choose an item or folder in Outlook that you want to print. For more information, see Print items in Outlook.